York Free Range Hog Roast Hire. The best Hog Roasts. Slow Cooked Free Range Succulent Pork, Tasty! If you require catering for your event in York then hiring a hog roast is the perfect choice for all sorts of occasions. Hog Roasts offer convenient no-fuss hot and delicious food suitable for both indoor or outdoor catering services. 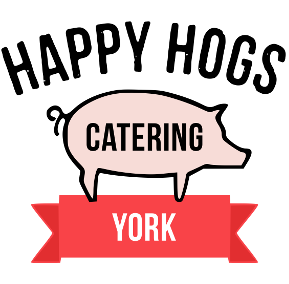 We are the leading York Hog Roast caterers, specialising in this type of event catering. The hog roast is set up on the arrival of our hog roast team, all in time for the required service time you specified. Once guests have finished eating (and also had their seconds!) our hog roast team will start collecting the plates, rubbish and clean up the venue leaving no mess behind – we take all the rubbish away with us. We ensure no hassle or stress for our York-based clients to make sure their hog roast hire occasion was enjoyed by all. The York Hog Roast hire package includes a hog roast chef in full uniform with assistant to help carve and cook for the party guests at the required serving time, a small catering marquee 3×3 metres, fresh bread, disposable plates with napkins, and a full cleaning service after the food has been enjoyed. Every hog roast menu we serve includes well-made throw-away knifes, forks and plates, but we do offer the facility to upgrade to 8″ porcelain plates with stainless steel cutlery or 10″ porcelain plates with stainless bead design cutlery. Equivalent upgrades are also available on dessert bowls with stainless steel spoons. Contact us to discuss pricing and availability. Competitive prices on hog roast hire menus and packages. Available across the York and Yorkshire area.